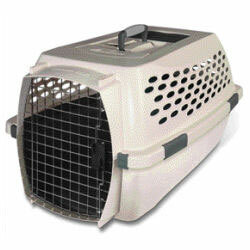 Kennel Cabs are available in sizes for cats and small and medium dogs. There’s no question – crate training your dog is the single best thing you can do to promote happy, healthy, and harmonious human/canine relationships in your family. Most of the problems that result in dogs being left at shelters: behaviours such as chewing, eliminating in the house, jumping up on visitors, separation anxiety, excessive barking, and more can be prevented through proper and effective crate training. This article provides information on the right ways to use your dog’s crate, and how to deal with difficulties that may arise. Your Dog Is Not a Human! A common belief among people who don’t really understand the nature of dogs is that putting a dog in a crate is cruel, that it’s like putting them in jail. This is an understandable reaction from a human who values freedom and considers their dog to be part of their human family. It’s only natural to feel that putting him in a crate would be mean and inhumane, and perhaps cause him to resent or even hate you, or maybe result in psychological damage. But you are not a dog, and your dog is not a human. Dog crates have long been taken for granted by dog show exhibitors, obedience and field trial competitors, trainers, breeders, groomers, veterinarians, and anyone else who handles dogs regularly. 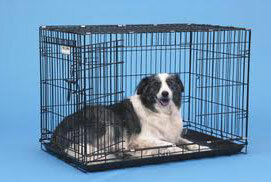 Individual pet owners, however, often reject the idea of using a crate because they consider such enforced close confinement unfair, and even harmful, to the dog. It’s very important that dog owners understand issues relating to dogs from a canine point of view. Dogs can’t see the world from a human point of view; it’s up to us to see the world from theirs. And for a dog, their crate is their own space, their retreat, their safe place, their security blanket. The crate helps to satisfy the strong denning instinct that is part of the nature of a dog. A dog that has learned to be in a crate will often choose to be in it even when he is not required to be. He is not afraid or frustrated when he is closed in; on the contrary he is happy to have that safe refuge. Dogs are more content and more secure having their lives controlled and structured by humans and would far rather be prevented from causing trouble than to be punished for it later. To you the crate may be a cage, but to your dog, it is home. Wire Great Crates for all sizes of dogs. enjoy the privacy and security of a den of his own to which he can retreat when tired, stressed, or ill. Dogs learn to love their crate as their very own special place. It becomes a familiar and secure place, at home, when away, when in the car, or wherever you and your dog may be. You want to enjoy your dog and be pleased with his behaviour, and your dog wants little more from life than to please you. A dog crate can help to make your relationship what each of you wants it to be. Furrarri crates come in a wide range of sizes. What Size Should The Crate Be? A crate should be large enough to allow the adult dog to stand, stretch out on his side without being cramped, and to sit up without hitting his head on the top. Appropriately sized, the crate will allow the dog to easily turn around. With a puppy, it’s best to start with a smaller crate and increase the crate size as he grows. Another option is to block off the back end so he is unable to use one end for sleeping and the other end for eliminating. Crate training uses the dog’s instinctual behaviour to keep his den clean, that is to not eliminate where he sleeps. Dogs that are kept in a bigger area are much harder to housetrain, because they have been forced to eliminate in their sleeping quarters. Where Should The Crate Be? Dogs are social animals, and should not be isolated. Confining the dog without making him feel isolated is really important, so don’t put the crate in the basement away from the family. The crate needs to be where the dog’s pack is, that is close to the humans, where he can be a part of family activities, even as an observer. This may be the kitchen or family room. If possible the crate should be moved around with you. At night, the crate should be in your bedroom. This provides comfort to the dog and allows him to adapt your own sleeping patterns. Having the crate nearby at night allows you to easily deal with any fussing that he might do. A young puppy (8 to 16 weeks) will normally have no problem accepting a crate as his own place. Any complaining or whining he might do at first is caused not by the crate, but by the process of his learning to accept the controls of an unfamiliar environment. In the majority of cases, the crate will help the puppy to adapt more easily and quickly to his new world. Collapsible yet sturdy, the Sof Crate is a terrific choice if you travel a lot. Be sure that children understand that the crate is not for them to play in, but that it is a private place for the puppy, and insist that this is respected. You must, however, accustom the puppy to letting you reach in to the crate at any time, and not allow him to become overprotective of it. Never, ever use the crate as a form of punishment. All this will do is cause your dog to resent and perhaps be afraid of the crate. It’s very important that your dog learns that being in the crate is a good thing, and once this happens, most dogs are happy to go in their crate at any time. 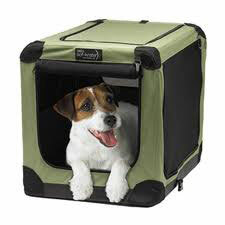 You can, however, use the crate for a time-out if your dog becomes exuberant or over active. Note that it’s really important that your dog gets adequate daily exercise, for both his physical and mental well being. He needs to be able to burn off energy, which helps to promote calmness. When you first introduce either a puppy or an adult dog to the crate, leave the door open and entice him to go in using treats or a favourite toy. The goal is to create positive associations with the crate. Feeding him in the crate will also help. Be patient. If he hesitates to go in the crate, be satisfied with him being near it at first. Try feeding him in front of the open crate door, then move his dish just inside the door, then gradually move it towards the back of the crate. Again, be patient. Never force the puppy into the crate. During his introduction to the crate you want to keep it positive. Entice him to go in the crate with treats frequently, leaving the door open and allowing him to come right back out. Give him lots of praise when he does go in. Let him see you toss a treat in the crate and encourage him to go in and get it. Keep it positive, and be patient. At first, when you close the door, stay with him and keep his confinement to very short periods. During this introductory time, don’t let him create an association with being in the crate and being alone. Gradually lengthen the periods he is in the crate. If things do not go too smoothly at first, don’t worry, just be persistent and be consistent. Remember, you are doing your dog a real favour by preventing him from getting into trouble while left alone. Don’t take him out of the crate if he is fussing or whining, as that will only teach him to fuss or whine again. Wait until he stops for several minutes, and then take him out as a reward for being quiet. Keep this low key, you want him to learn that going in and out of the crate is not a big deal. It’s important to realize that crating the puppy does not by itself teach him to be housetrained. You must use his natural instinct to not soil his den to teach him that outside is the proper place for elimination. First, be sure he has eliminated shortly before being put in the crate. As a rule of thumb, your puppy can be crated for the same number of hours as his age in months (e.g. three hours at three months). Immediately on taking him out of the crate, take him outside to the area you want him to eliminate in. Keep it strictly business – you are taking him out to eliminate, it’s not to play or have fun. As soon as he eliminates, give him a reward: tell him what a clever dog he is, give him a treat, or play with him. He’ll quickly learn the routine: crate, outside, pee, fun! To be successful and housetrain your puppy quickly, you want to prevent him from making mistakes. Never let your puppy have the run of the house. He must either be supervised all the time or confined. If you have to leave the room, even for a minute, either take him with you or put him in his crate. Learn to anticipate the times he will need to eliminate, such as right after a sleep, after eating or drinking, after playing, and immediately after being in his crate for any length of time. Take him outside so he can eliminate and then reward him. If he makes a mistake, it’s not his fault, but rather it is yours. Do not punish him, the old “stick his nose in it” does not work. With persistence and consistency, your puppy will quickly learn to go outside to eliminate. 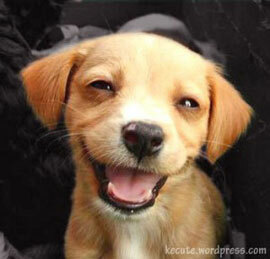 Crate training makes for happy dogs and humans! Most of the common problem behaviours of adult dogs are caused by the lack of a feeling of security when left alone. A crate can provide the security he desires and usually solve these problems, but it must still be introduced gradually, and it is very important that the dog’s first association with it is positive and pleasant. Most of the time? Yes. Always? No. Crates are used successfully by most dog owners, but there are some dogs which simply cannot or will not tolerate this form of confinement. This is not nearly as common with young puppies as with adult dogs, but it does happen, particularly with adopted or rescued dogs, dogs which may have suffered a traumatic experience while crated, or an unadaptable senior dog. In some cases a dog will use a crate readily as long as the door is open, but will object the moment it is closed or when he is left alone. These reactions definitely represent the small minority, and most dogs can successfully be trained to use a crate. While a crate may not always work, it is always worth a try. When it does prevent or solve problem behaviour, it is truly the “best friend” you and your dog could ever have. 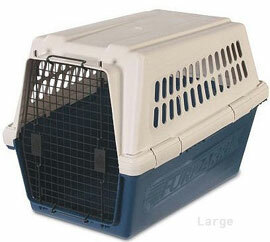 A Pet’s Life carries a wide range of crates, including Furrarri, Great Crate, Kennel Cab, Vari Kennel and Sof Crate. For more information and advice about the options and to find the crate best suited to you and your dog, talk to any of our knowledgeable staff.